Question: My 2 handle bathroom faucet is leaking. The faucet is a Delta Bathroom Faucet and it has two knobs or handles. When I turn on the cold water handle, water leaks from under the handle. If the cold water handle is not turned on it does not leak. The hot water side does not leak. If the cold water handle or knob on my bathroom faucet leaks when turned on, what is the easiest way to fix it? I want to fix it without spending much money or buying a new bathroom faucet? Can you tell me how to take it apart and what parts I may need to fix or replace? How To Repair A Leaky Two Handled Faucet? Step 1 – Turn the water off using the water valve under the sink. Step 4 – The packing nut that the stem goes through will now be visible. Step 5 – Use a wrench or pliers to remove it. Step 6 – Do not scratch the nut, use a paper towel over the tool when removing it. Step 7 – On the stem you will see a small rubber o-ring. Step 9 – If there is an o-ring inside the packing nut, replace that o-ring also. Step 10 – Check the threads and if corroded clean with a wire brush. Step 11 – Use thread compound or silicone grease to lubricate the threads. Step 12 – Put the faucet back together. Step 13 – Turn the water back on under the sink to the faucet. Step 1 – Turn off the water to the faucet under the sink. 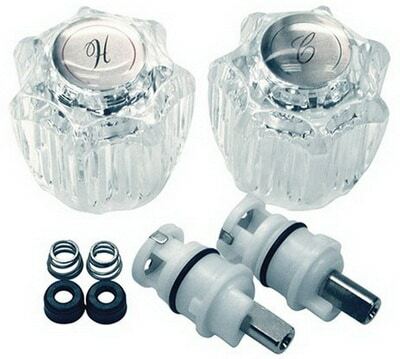 Step 2 – Use a flat screwdriver and use a prying motion to remove the decorative cap on top of the handle. Step 3 – A handle screw will now be visible, remove the handle screw with a screwdriver. Step 4 – Pull off the complete handle. 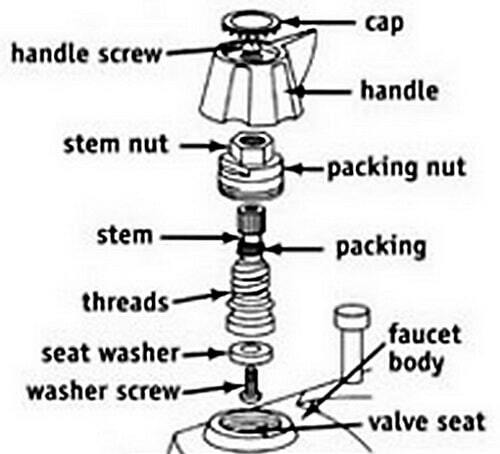 Step 5 – Use the proper wrench size and unscrew the packing nut. Step 6 – Unscrew the stem. Step 8 – Take the stem out of the packing nut. Step 9 – Replace the worn o-ring with a new o-ring. Step 10 – Use thread compound or silicone grease to lubricate. Step 11 – Put the faucet back together and tighten the packing nut. Step 12 – Turn the water back on under the sink to the faucet. NOTE: There are both 2 handled STEM FAUCETS and COMPRESSION FAUCETS, the info on this page will work with small variations to fix both. The above water faucet leak repair instructions are for both sink faucets in bathrooms and in kitchens with 2 knobs or handles. 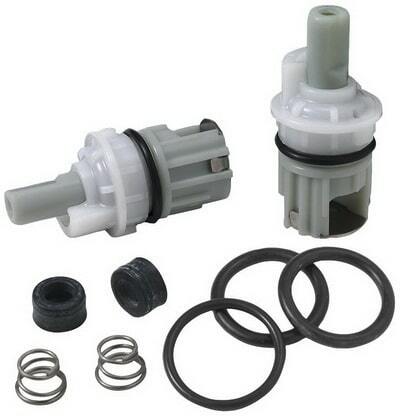 There are water faucet repair kits that are available to fix your bathroom faucet leak. These kits have everything included to fix a faucet leak under the handle. 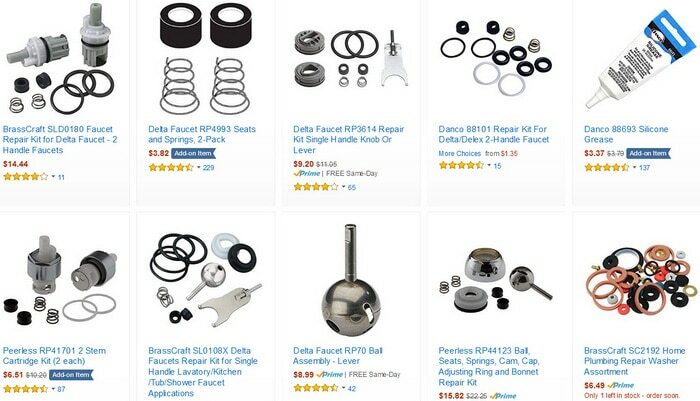 Most kits include Seats, Springs, Cams, O-Rings, and the ball assembly. Leak repair kits are available to fit kitchen, bathroom, lav, and bath faucets. 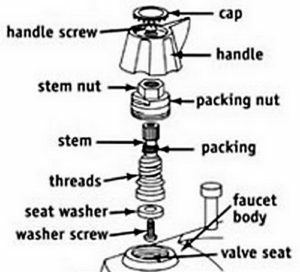 See below for some repair kits for your leaking faucet. Questions? Leave your question below and we will assist you with your faucet leaking problem. I have a bath tube with a two handle Delta faucet. I can not keep the hot water from leaking from the spout. I change the seat and spring and it stays fixed for about 4 or 5 days of use. Then it starts leaking again. When I check the rubber seat that I removed it is warped. I’ve repaired several times. Same problem after 4 or 5 days. I have also replaced the valve as well. Any ideas? Previous post: My Refrigerator Won’t Stay Cold – Food In Freezer Thawing – What Could Be The Problem? Next post: LG Washer Error Code CL – How To Turn CHILD LOCK Off?